If you look at my play count on my iTunes you'll see one song that's played pretty regularly; Please Don't Go off of their debut album Cooleyhighharmony. If I can name one R&B song that defines me, then I would definitely pick this one. But that's just one of the many songs that Boyz II Men have in their their extensive catalog of hits. 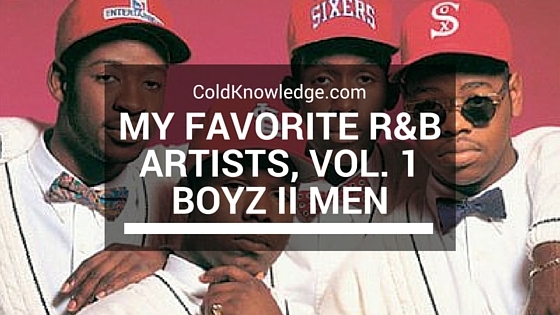 When you think of hit R&B acts you can't help but think of them as one of the first ones to come to mind. When I think of great musical acts, I think of artists that make music that can still be played even ten years after the fact. That's exactly what Boyz II Men did for great stretch of their career. Everyone knows that 90's music is considered one of the greatest stretches of music for the simple fact that Black Entertainment started to really come into it's own on the mainstream front after being held down for so long. Essentially forming in 1990 after changing their name from Unique Attraction to one after one of New Editions hits, they debuted in 1991 under the guidance of one Michael Bivins of New Edition and Bell Biv DeVoe fame, the group rose to prominence and became one of the staples of 90's R&B music. But everyone is different when it comes to music. A lot of people try to downplay Boyz II Men's significance during the 90's music scene and in the same breath, those people have no idea what they are talking about. It was nothing to be out and about and to hear one of their songs on the radio, on a Sunday evening while I was running around outside. They blended that old school / funk / new jack swing / R&B sound so well. Having Mike Bivens behind them benefited them greatly since he knew what worked and what didn't. They all had their own sounds and my favorite part of the whole act was when they started off the song and they were all going, the mini breakdown came, then big Mike came and dropped that talking portion of the track and you had them come back in a drop them high notes on us like it was nothing. Boy that's the type of singing that I like. Whether you don't like them for personal reasons or you simply just weren't around to understand why they were a big deal, you can't deny the numbers that they put up. Three platinum albums and two gold ones before downloading music became a thing; with two of the platinum albums selling 9 million and 12 million each. That's right, they have a diamond album under their belts, with one more on the verge. That's what greatness looks like ladies and gentlemen. There was no other way I could start off this series than introducing these guys. Definitely one of the timeless groups ever, and one of my favorite. One of these days we'll actually get them all back together and we'll get something special one more time.